Distributor: Cost Plus Inc., of Oakland, Calif. Hazard: The chair backs can come loose from the seat base, posing a fall hazard to consumers. Description: The wooden office chairs have the following brand names, SKU numbers and purchase order numbers: Konrad models SKU #415413, and PO numbers 200360055, 200360056, 200360057, 400360062, 400360063, 400360064; and Loft models SKU #415414 and PO numbers 200360058, 200360059, 200360060, 200360061, 400360065, 400360066, 400360074, 400360075. The SKU number and description appear on the sales receipt and original shipping carton. The PO number is located on the underside of the chair itself. Sold at: Cost Plus/World Market stores and Web site nationwide from January to December 2009 for about $170. 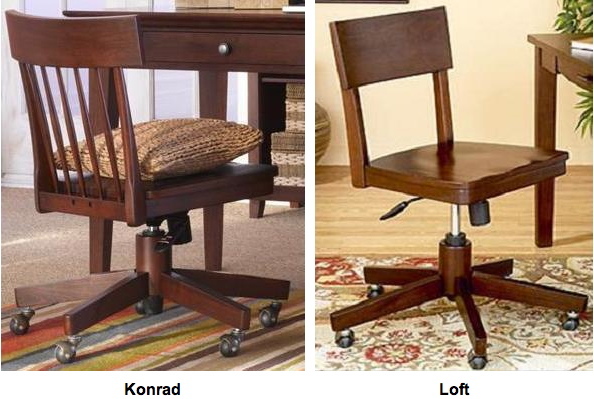 Remedy: Consumers should immediately stop using the recalled Konrad and Loft office chairs and return them to any Cost Plus/World Market store for a full refund or exchange.